The future is still very uncertain for the first openly gay NBA player. 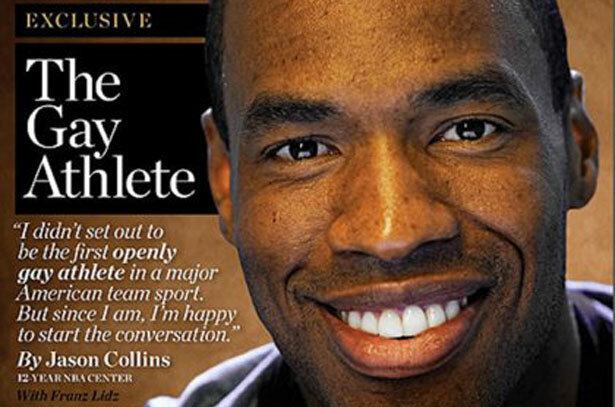 We can update that question in the case of unemployed NBA center Jason Collins. Here is a man who made history last spring by becoming the first active player to come out of the closet in the “big three” USA sports leagues and told the world that he was gay. He was praised by teammates, league officials, presidents and kings (OK, Bernard King). But now just for being himself, after a career as the epitome of a “team player”, he has been labeled “a distraction” and finds himself on the outside looking in at the start of the NBA season. I attempted to reach out to Jason Collins and ask him about his status as a man without a team, but, as I heard from several people close to the veteran seven-footer, he is not talking. Collins is not speaking to the media because he believes that he could still catch on somewhere before the All-Star break. He has concluded that being quiet at this moment in time and not making a big stink over his inability to land a contract is the best course of action. He may be correct, but therein also lies the problem: the demand that silence is the way to get back into the good graces of league executives. I do not believe that most teams are led by secret members of Focus on the Family. I do not believe that when Collins came out, NBA General Managers secretly had this collective reaction. I do believe that they consider Collins’s sexuality to be a “media distraction”, and in the buttoned-up corporate world of twenty-first-century sports, “media distractions” are only slightly less welcome than staph infections. I also believe that by sending the message that being gay is a “distraction”, NBA execs are bottle-feeding the homophobia in US society. This fear among NBA suits that “distraction” will derail winning has no basis in historical fact. Do off-court “political” distractions actually hurt a team’s ability to compete for a championship? It is difficult to think of a more political player in NBA history than Bill Russell who won eleven championships in thirteen years and is only getting his own damned statue this weekend. If Russell’s political resume has any historical competition, it would come from Kareem Abdul Jabbar (five rings), Bill Walton (two rings), or Steve Nash (back-to-back MVPs). Being an actual human being, with interests and concerns off the court, is not a “distraction” from wanting to win. And yet here is Doc Rivers now coaching a stocked Clippers team whose greatest obstacle to the NBA Finals is not the Spurs or Thunder but their own two young big men who cannot seem to corral their wild-limbed physical potential, a situation tailor-made for a certain 35-year-old veteran. But let’s not single out Doc Rivers. Despite Collins age, there are a sizable number of general managers who say that he should still—based on ability alone—be able to find a home in the NBA. But now Jason Collins does not appear to be a September or October player and is just hoping that he could possibly be a “January ten-day-contract player”, while also trying to prove in the meantime that he has no desire to be a distraction. The inability of any team throughout the NBA—in David Stern’s final season—to find him a roster spot, however, could prove to be more distracting than Jason Collins ever could be. When Collins came out, Martina Navratilova called it a “game changer”, saying, “Collins has led the way to freedom. Yes, freedom—because that closet is completely and utterly suffocating. It’s only when you come out that you can breathe properly. … Millions of kids will see that it is OK to be gay. No need for shame, no need for embarrassment, no need for hiding.” If teams choose to send the message that “being gay is a distraction”, then people can rightly wonder just how much has actually changed. The latest Student Nation looks at student mobilizations, including the effort to change the culture of violence and discrimination at UConn.